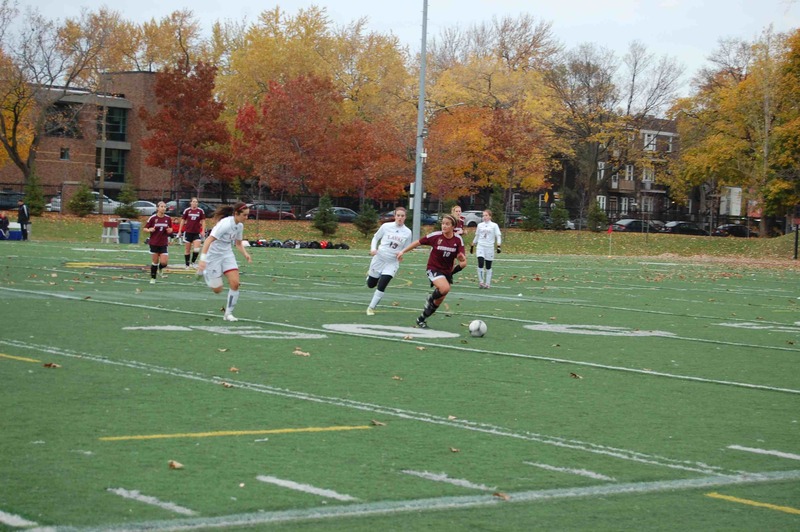 It’s been years since Concordia’s women’s soccer team made the playoffs. This season, it came down to the final game on Sunday to officially eliminate the team from playoff contention. The Stingers lined up with the same 4-4-2 formation as usual. Melissa Kedro partnered with the team’s leading goal scorer Jennifer Duff up front. Shauna Zilversmit, Elizabeth Allard, Valerie Ishak and Gabriela Padvaiskas formed the midfield. At the back, Alexandra Dragan, Shannon Travers, Philippa Lyttle and Kayla Myre played ahead of Saby Dagenais in goal. Laval were the stronger side from the start. The visitors forced Concordia to defend for most of the first half. The Stingers were able to defend well by staying organized and with their compressed playing. The Rouge et Or had the first real chance of the match. In the 18th minute, a corner kick from the right bounced inside the six-yard box. Concordia’s Ishak made two great blocks with her body to deny a goal. Five minutes later, Laval would get the opening goal. From another corner, the ball flew to an unmarked Frédérique Paradis. Her header towards goal was tipped in by teammate Gabrielle Lapointe. In the 28th minute, the Stingers were close to grabbing the equalizer. Duff controlled a through ball and set off towards goal. A last minute slide tackle by a Laval defender inside the penalty area, thwarted the attack. Before the first half was over, Laval had a few more quality chances to double its lead. With one minute remaining, Dagenais had to make a massive save by denying a Laval player from point blank range. She ended up making a total of eight saves in this encounter. In the second half, knowing only a win would save the season, the Stingers came out firing on all cylinders. In the 60th minute, Duff had a chance to tie the game with her shot from outside the box. The ball bounced by everyone, including the Laval goalkeeper, but ended up hitting the right goal post. Seconds later, on the other side of the pitch, Laval would make Concordia pay for the miss. After making a good run, Léa Chastenay-Joseph was able to receive a long ball and dribbled alone on a breakaway. She made no mistake sliding the ball under Dagenais and into the Stingers’ goal. The rest of the match was very physical, but the maroon and gold was unable to get back into the game. This loss in the final game officially ended the Stingers’ season. Concordia played an organized match, but a few slip-ups cost them two goals. Having a bit of luck would have also been nice, as Duff’s shot off the post would have completely changed the game if it went in the net. With the loss, Concordia ends their season with six wins, five losses and three draws, good enough for 21 points. This fifth place finish is the Stingers’ highest since 2007.